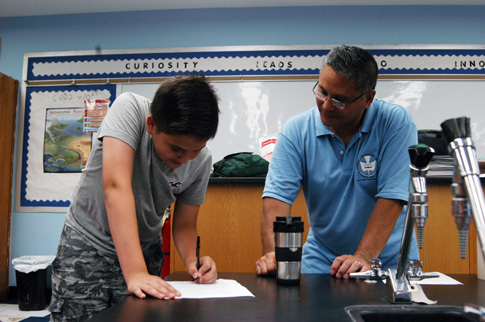 Cathedral Prep’s Jeremy Reyes, science teacher, works with a student at the school’s Troike Summer Leadership Program. This year the school launched a new program to give students extra academic support. Another way Cathedral Prep School is helping incoming freshman is through a new academic support initiative called the St. John Vianney Program. Launched this July as part the Father Troike Summer Leadership Program, about half of the incoming class of ninth graders will receive extra academic support. Principal Richie Diaz said that the idea for the program came after two years of noticing that some incoming students needed a better foundation in math, English and other subjects. In its first year, eighth graders participating in the Troike Summer Program were divided into two sections: Honors and Vianney. The Vianney Program will go on to support the specific academic needs of the Class of 2019 and beyond. Mario Alejandro Olmedo, who will be joining Cathedral in the fall, said the Vianney Program helped him improve his grammar, which he had not been able to learn when transferring middle schools. 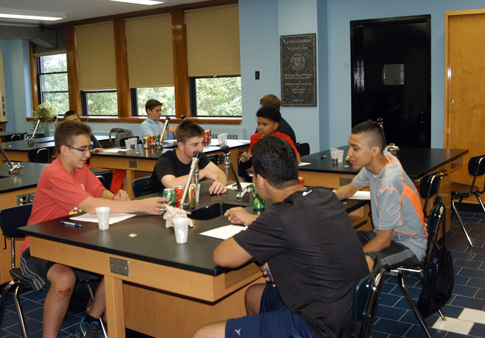 Incoming freshman at Cathedral Prep School participate in the Troike Summer Leadership Program, which now includes the St. John Vianney Program for extra help in academics. He added that he liked the small number of students in the Vianney section of the Troike Program and that the friendly teachers made him look forward to joining the school that he will be attending for the next four years. “Everybody is welcomed and here nobody is going to get discriminated (against),” he said. The program is named after St. John Vianney, who struggled with academics as a seminarian and later became known as one of the greatest confessors of the Church. “John Vianney is an inspiration to many because he did have a weakness and he was able to overcome that. That is what this program is all about,” said Father James Kuroly, assistant principal, who has been working to implement the new initiative. To help students succeed, math and English teachers will coordinate the program and meet with students to track their progress. Father Troike would be pleased. In the summer of 1970 he gathered a number of incoming Freshmen to the Summer Program who needed some assistance and preparation to pursue the rigorous course of study of Cathedral Prep. Young men like myself and Ric Raveneau, Charlie Scheidt came and learned study skills under the watchful eye of Fr. Hank Doherty. The St. John Vianney Program for extra help in academics has its roots in this experience, which was not formalized but something Fr. Troike took on so that those of us coming in could have a complete, full and rich experience the Prep, spiritually, socially and academically. Commendations to Principal Diaz and Father Kuroly for instituting what was an informal endeavor quietly led by Father Doherty and Troike. It is good to see their spirit living on some 45 years later.